A key concern for the success of MSP is active participation of stakeholders in the planning process. However, MSP is a relatively new concept for many stakeholders, at least in Poland. How is the general public engaged in MSP? The project covered entire Polish marine areas i.e. internal waters and territorial sea (12-nm zone from the baseline) which is approximately 10,811 km² and exclusive economic zone which is about 22,573 km². However main activities took part in various coastal cities in Poland: Szczecin, Świnoujście, Łeba, Władysławowo, Kołobrzeg, Darłowo, Ustka, Gdynia and Słupsk. A key concern for the success of MSP is active participation of stakeholders in the planning process. However MSP is a relatively new concept for many stakeholders at least in Poland. The issue of MSP has been discussed for a long time among researchers and sea responsible national public authorities but business sector and local and regional self-governments have not been involved so much. The pilot MSP projects in Poland created opportunity to change this situation but even this relatively huge effort on public participation did not managed to activate some remote relatively weak or loosely organised stakeholders. Moreover, preparation of the Natura 2000 Management plans proved that only really serious issues or threats could mobilise stakeholders for being active. However, sometimes it was too late and such ad hoc engagement resulted in conflicts instead of facilitating finding of joint solutions. Therefore building of capacity of some stakeholders at the beginning of the planning process was perceived among key challenges that should be properly addressed for the success of the MSP in Poland. Some good practices on stakeholder capacity building existed (e.g. from Latvia) in the neighbouring countries. Thus they could be used for the benefit of the Polish MSP process. One of the key lessons learned from Latvian experience on stakeholder engagement was a need to approach small stakeholders in their own environment. Such stakeholders were too small and too preoccupied with their own businesses to have time to attend long meetings in a large cities located far away from their places. Preparation of a legally binding maritime plan for all Polish sea areas, (except areas of ports, the Szczecin Lagoon and the Vistula Lagoon) officially started on 15th November 2013. Therefore it was expected that in 2014-2015 a first draft of the maritime spatial plan should be available for public discussions. Thus it seemed that 2014 and 2015 were the most appropriate period for stakeholder capacity building in Poland. One could assume that planning process would raise stakeholders interest in MSP and would increase their willingness to participate in the process that might directly affect their future well-being and perspectives of their businesses. Therefore the action supporting public participation in MSP in Poland was scheduled for 2014-2016. The work on stakeholder capacity building in Poland was pursued in the framework of the project entitled “Public participation in MSP in Poland” dedicated to this issue and co-financed from the EEA Grants and Norway Grants 2014-2021.The action was led by Polish Offshore Wind Energy Society (POWES), supported by the Maritime Institute in Gdańsk and Institute of Marine Research in Bergen. The project has been elaborated and run under the specific EEA programme “Citizens for Democracy”. The work started in September 2014 and continued till April 2016. The project was initiated by the off-shore energy sector as a contribution to the Polish MSP process that was for many years awaited by this sector. The main objective of the action was to raise the level of public participation in the MSP process. It aimed at stimulation of public discussion and engagement of key local stakeholders, with particular focus on the deprived and disadvantages ones like small-boat fishermen. The emphasis, however, was put on explaining the development of the offshore wind energy as a new maritime sector in comparison to the traditional sea users (fisheries or shipping or coastal tourism). The method involved the organization of multi-stage public consultations in a form of seminars with the participation of representatives of local communities accompanied by the MSP experts and the representatives of the maritime administration responsible for the MSP in Poland. The meetings were organized in selected towns and cities at the Polish coasts with focus on the smaller ones. Usually they were located in a well known building such as a local town-hall or administrative or business headquarters. The meetings were preceded by an active promotional/information mailing campaign. Information about meetings were published in the web-based information portals of the local self-governments or hung directly on their bulletin boards in their headquarters. Invitations were mailed directly to the representatives of the organizations active in the maritime economy and representing local communities, in particular non-governmental associations from the civic and ecological sector, professional organizations (unions and associations of fishermen, etc. ), local government authorities, port authorities, etc. Each time a local mayor was invited to the seminar, just for underlying of the importance of the meeting. Some of them attended the meetings indeed. Profile of invited guests varied depending on the specificity of the town, in which meeting, was organized. An initial list of stakeholders was provided by the maritime administration. In addition to these, the potential participants of the seminars were identified through screening the media information and by searching databases of NGOs. The organizers of the seminars encountered also local authorities whose staff willingly gave guidance whom to contact, even with the names of appropriate persons or e-mails of the relevant organizations. The meetings were accompanied by the educational activities. Each seminar was enriched with a mobile exhibition in the form of eight information boards, related to the subject of the meeting. Four of them were devoted to guidelines for preparation of the maritime spatial plan for Polish maritime areas, while others to the issues related to the construction of offshore wind farms. The meetings were marketed and posted as a chance to contribute to the development of the report containing proposals to the maritime spatial plan under preparation within the formal MSP process run in parallel. Therefore the meetings were expected to result in some concrete recommendations to the plan. From this point of view, the most important were two series of information and consultation meetings, carried out in the second and third phases of the project. Each meeting was carried out in an interactive manner as a workshop that allowed stakeholders to freely express their opinions and concerns, compare them and discuss. Moreover, the workshops gave the participants a chance to enter into informal interactions among themselves and with maritime administration and thanks to that verify some popular concerns and beliefs on MSP. Areas / facilities / infrastructure probably for reassignment under the maritime spatial plan. Areas / facilities / infrastructure, whose current function is to be preserved in the maritime spatial plan. Areas / facilities / infrastructure, which are a source of potential conflicts of interest. This was done using the stickers. The indications made by the participants were recorded by the organizers of the workshop and then discussed with their authors at a plenary session. 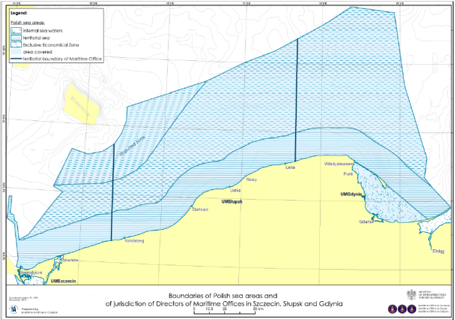 The picture below shows the results of the joint work on the map visualizing spatial dimension of the comments and proposals to the maritime spatial plan of the Polish maritime areas. Map presenting shares of various branches in recommendations and suggestions to the plan divided by locations of the meetings: (off shore energy – grey colour, off-shore mining – pink colour, infrastructure – red colour, fishery – violet colour, nature conservation – green colour, coastal defence – brown colour, national defence – navy blue colour, tourism – light green colour, navigation – light blue colour). As a preparatory action aiming at stakeholder capacity building, the action has had no legal consequences. But it informed the official planning process. The action aimed at supporting the preparation of legally binding maritime spatial plan in Poland. The main impact was on improving consciousness of the stakeholders by offering them updated information on the MSP process and encouraging them to express their concerns. The report from the seminars and workshops has been used in the official MSP process in Poland as a general background document. A key obstacle was that the first draft of the official maritime spatial plan in Poland was not released during the execution of the project as it had been assumed when submitting the EEA project application. Therefore the participants could discuss the MSP only in general terms, having no knowledge on concrete planning solutions that could affect them in reality. This has negatively influenced the usefulness of the opinions and comments collected during the seminars, and diminished impact of the action on real planning and decision making. The action informed the stakeholders on MSP and allowed them to better define and understand their stakes. The most noticeable result was engagement of small stakeholders that have never participated in any MSP pilot activities, nor in preparation of the management plans for the Natura 2000 sites. The action has positively verified the Latvian experience of importance of engaging stakeholders in their day-to-day working environment. However, due to the leadership of the action (assigned to the off-shore energy sector) and focus during the seminars on this particular issue some of the stakeholders started to perceive MSP as an off-shore energy driven attempt favouring this particular sector. This should be considered as unexpected ”bycatch“ of the project. For instance the second workshop in Kołobrzeg ended with no results at all. The meeting proceeded in a very stormy atmosphere, caused by anxiety of participants about the conflict of interest between the fishing industry and the off-shore energy and its instrumental role in MSP. While designing the action on engagement and capacity building of stakeholders one should first consult existing good practices from the countries in which the process of maritime spatial planning has been advanced. Enhancement of public participation and stakeholders capacity building actions should be conducted by the neutral institutions. i.e. the ones not perceived as being engaged in conflicts and disputes related to the plan. Close cooperation with the maritime administration is necessary at every stage of these actions since it raises their credibility and their transparency. Extremely important for the capacity building of the stakeholders are efficient public relations and efficient promotion, which should be handled by the specialized agencies in this field. Niche issues of maritime spatial planning requires preparation of a comprehensive and long-term educational campaign. Also extremely important for the success of these actions is attendance at the meetings and seminars. For this purpose it is necessary to co-operate not only with the maritime administration but with all other relevant sources of information for mining the contact information of those who might have interest in the MSP. One should also think about the wide distribution of information about the meeting. It is worth considering making use of paid advertisements in the local media. Certainly cooperation with the local clusters, networks of NGOs, etc., if they exist in the area might work. Moreover, the organizers should do an independent effort themselves for identifying relevant organizations and businesses potentially affected by the MSP. The objectives and thematic scope of the meetings with stakeholders should be accurately explained to the audience at the very beginning of the workshops. Information should be communicated in a simple language, preferably in the form of concise and clear expressions. It is vital also to enable a broad discussion with the possibility to ask questions. This allows to avoid many misunderstandings and to clarify the level of knowledge of participants on MSP. Since maritime spatial planning, is still not a very popular topic one should emphasize its importance and the impact that it will have on a life and professional work of the stakeholders. From the point of view of the appropriate engagement the most desirable professional groups in the workshop discussion and for the sake of the proper selection of the arguments presented during the meeting it is important to analyze before the meeting the structures of the invited business organizations and to examine the possibility of conflicts of interest within the same sector, which often is the case. Also for the same reasons one should organize separate meetings on maritime spatial planning dedicated to specific industries or their clusters in order to develop a common position for the whole sector or industry and its expectations towards the MSP. An important challenge is translating into the planning language (in the form of possible planning solutions) the complexity of local conflicts of interests and the needs and expectations of all stakeholders. The ultimate result should be the publication of the collected results to maintain them and make them available to a wider group of stakeholders. This practice is applicable in some other countries but must be adapted to their specificity. The lessons learned described above should be concerned first. A key problem with transferability is that all materials are available only in Polish.